Marriage Date, in one’s life, is the most important thing which determines the luck of the couple in the following years to come. When marry determines how rest of the life a person leads as the spouse affects more than half the life of the person. Therefore most of the auspicious dates or marriage or Muhurat should be calculated. When you will ready to marry, in that time the most important thing is that you have to understand whether you are in love or not. 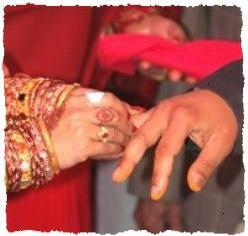 When you will calculate the dates of your marriage, you must consider the system of Indian astrology and Hinduism. There are several rules to find the best day of marriage or Muhurat. If the starting date is auspicious for both the couple then they can have long lasting happy, healthy and wealthy relation- ship. Indian Vedic Astrology is the most mature among all the astrological prediction in world. This is very complex as well. We have tried to describe some of the key points in simple terms. We have implemented the same to calculate Muhurat and you can get a free calculation based on your birth dates. When Jupiter Or Venus is combust by sun. Combust days of jupiter and venus, Mars should not be in 8th house and Venus should not be in 6th house. Some Nakshtras Star are not good for marriage day. When moon is in 6th or 8th or aspected by inauspicious planets. When moon with sun or mars or with venus in same house for either of boy or girl. Marriage Day or Muhurat or When to Marry should have the following rules satisfied. When moon transits nakshatras : Rohini, Mrigasira, Hastha, Swathi, Anuradha, Moola, Uttarashada, Uttarabhadra, Revathi. Best time for marriage is the time when sun sets. This is also good time for beginning of a long time relationships between couples. There are many other rules which are not mandatory. But a recommended to follow that we can- not cover those rules here to avoid complexity. Check for your Marriage time report for Free in Moon Astro Here.